Sentiment Analysis is the use of Natural Language Processing (NLP), Text Analysis and Computational Linguistics to identify and extract subjective information from text. Every day, hundreds of thousands of news and opinions affecting publicly traded companies, commodities, and currencies, are made available in the public domain – through News Publications, Blogs, and even Social Media. Sifting through all this data in real-time, to determine which events and reports could potentially have a positive or a negative impact on the underlying Security, is not humanly possible. Heckyl has developed its own proprietary Sentiment Analysis engine, that efficiently and accurately computes a Sentiment for companies, commodities, and currencies, based on news articles flowing into the system – in real-time. What exactly is News Sentiment, and why is it important? News articles often exhibit various qualitative attributes about the entities mentioned therein. For example, news about some pharmaceuticals company being awarded a new drug patent is positive for the company, because a patent could potentially go a long way in generating revenue and strengthening its financials. Similarly, news about a labour-strike at an automobile manufacturing plant of a company is negative for the company, since a single day with no production could translate to a significant revenue loss for the company. As such, any news about a company can be classified as having a positive, negative, or neutral sentiment. For a human reading news, it’s quite simple to quickly make a qualitative decision about its sentiment. Computers need sophisticated techniques to determine essentially the same thing, but can process a lot more data. Automated sentiment tagging allows us to quantify Natural Language! It then becomes possible to perform statistical analysis, and also generate intuitive graphs and visuals to provide informative snapshots about companies, commodities, and currencies. To get a quick overview of what’s been happening with a company, we can plot a pie-chart, showing the percentage of positive, negative, and neutral articles about it from the last 6 (or 12) months. If the negative slice is significantly larger than the positive slice, we exercise caution before deciding to invest in that company. By plotting sentiments on a timeline, we can also potentially discover trends. Consider plotting sentiment data of a company on a timeline for the last 12 months. If we see that negative articles are largely clustered between 6 and 12 months ago, but most articles in the last 6 months (most recent articles) are positive, we may conclude that the company was going through troubled times earlier, but is doing better now. Take the case of our Sector Sentiment Heatmap – A visual snapshot that provides a quick overview of what has been happening within a sector. If all the companies in a sector have the same sentiment (either positive or negative), we should investigate fundamental factors affecting the sector and get some insights about its likely performance in the near future. 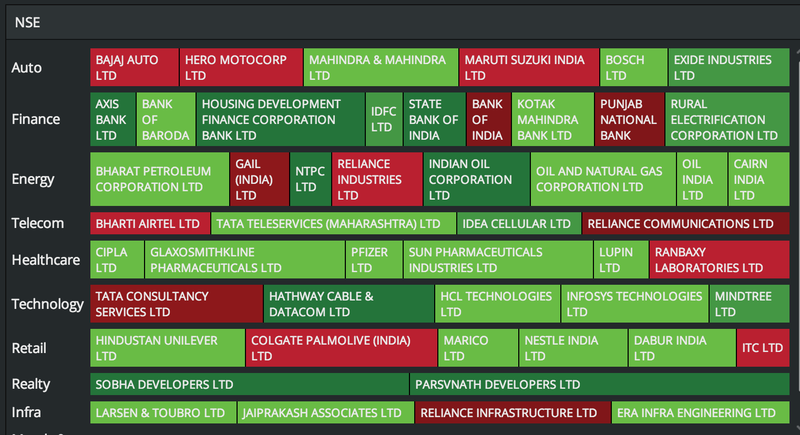 News Sentiment based Sector Heatmap, available on Heckyl’s Analytical Platform – FIND. Another useful feature would be to find a list of all the companies that either have a positive or a negative sentiment for a particular day. This allows us to get a quick snapshot of all such companies, instead of manually having to look for them, thus helping us in quickly identifying possible trading opportunities. Companies with Negative Sentiment on January 15th, 2015 available on Heckyl’s Analytical Platform – FIND. How does Heckyl perform Sentiment Analysis? How is it different from simply classifying News based on the presence of certain positive or negative keywords? Heckyl’s Sentiment Analysis engine does not simply classify News; it classifies News for a Company! It is entirely possible for the same News to be positive for one company, and negative for another. Consider a simple keyword-matching system that has ‘wins lawsuit’ as a positive keyword. For some News like “Company A wins lawsuit against Company B”, such a system might tag the article as having a positive sentiment, whereas the News is actually only positive for Company A, and negative for Company B. Even for News titles that mention only one company, a simple keyword-matcher is not good enough. A positive keyword like ‘to revive sales’ would work for a News title like “Company A adopts new marketing strategy to revive sales”, but not for News like “Company A’s new marketing strategy fails to revive sales”. A simple keyword-matcher would tag both these as positive for Company A, based on the mere presence of ‘to revive sales’, even though the latter News title is hugely negative for the company. Heckyl’s Sentiment Analysis engine is sophisticated enough to accurately determine the sentiment even in such cases. It uses a combination of Natural Language Processing and complex rules to make sure that semantic inflections are correctly interpreted. Additionally, it also assigns a Sentiment Score on a normalized scale, based on inputs from domain experts and analysis of historical data, to indicate how positive or how negative an article is, for a company. When used in conjunction with fundamental and technical analysis, it can be a powerful tool to make sound investment decisions. 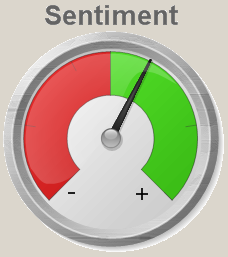 News-based sentiment analysis for the stock market is a subject of ongoing research. At Heckyl, we keep exploring new ways to use Sentiment Analysis to augment existing techniques of analysing the stock market. To know more, contact at info@heckyl.com. This entry was posted in Home, Technology and tagged Natural Language Processing, Sentiment Analysis, Technology.